Fascination finally got the best of me, I actually invested in a for real published paper model kit. 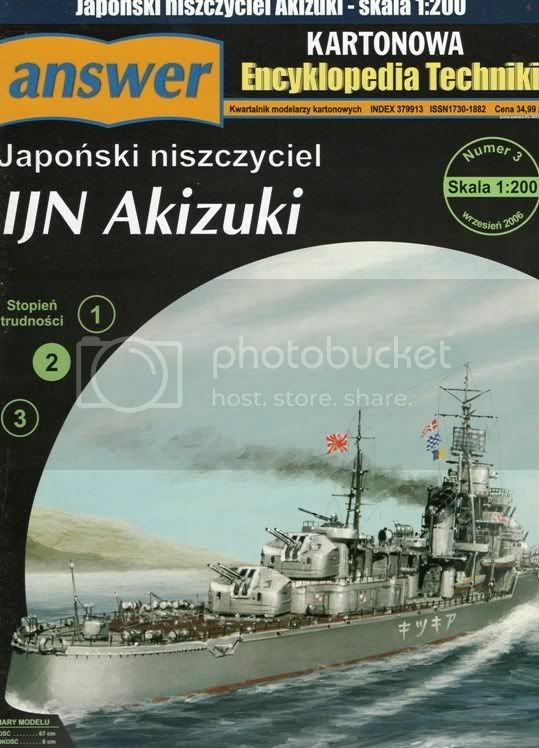 The subject at hand is answer Models(no, it isn't a typo, that is how they do it) 1/200 scale IJN Akizuki destroyer. While I am sorely tempted to convert it to a styrene build like I did with the Digital Navy free download of the Admiralty Class Minesweeper that I discovered online, I figure I might as well see what this is all about, bite the bullet and do it to it. 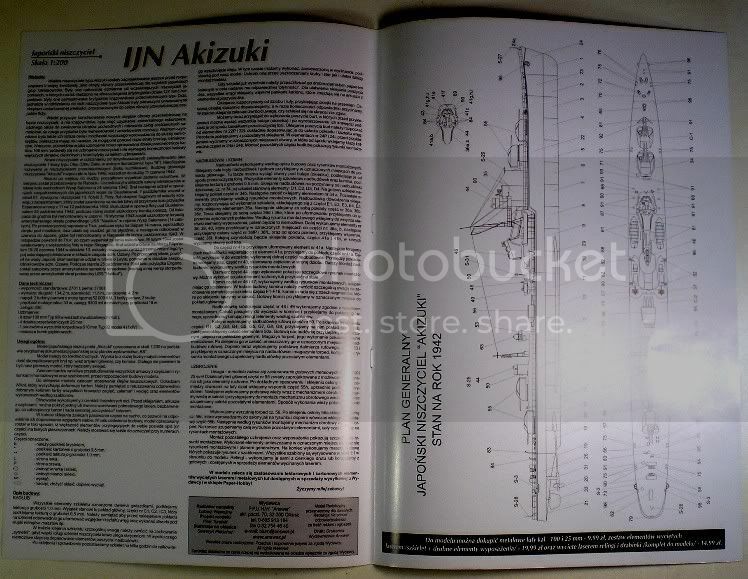 For the details of my purchase, I found the Paper Models website, located in Chicago while I was researching information about the Akizuki. My preferred scale is 1/700, but the idea of having one in 1/200 was a deciding factor, that and the down right inexpensive price of $11.95. The last 1/700 styrene Akizuki I bought cost $17.95 so I figured I couldn't lose following the "Texas" theory of financial management, bigger and cheaper is always better. It took all of 10 days from ordering off of their website using the old plastic to recieving it at my PO Box. It may have been a little quicker had it not been for Martin Luther King Day. It came in a heavy white paper fabric cover envelope sandwiched between two pieces of cardboard with the "DO NOT FOLD OR BEND" label in large print on both sides. But kudos to Paper Model Store for their good service. I recieved an 8 and 7/8's by 12 and 15/16's inch booklet consisting of 14 pages. The first two and last two are typical magazine page type material, the remaining ones are all a bit thicker material printed on one side and hold the parts of the model. These are roughly the same thickness of a yellow manilla file folder. The printing for the exterior parts is all in color with the remaining ones being black and white. Being that this is a Polish publication, all the text is in Polish, one of the little hiccups that I will have to get over. If push comes to shove and I absolutely must have some portion translated, there is always Babelfish, Googles' handy free translation service. I have used it before to decipher Morskie Monographs and AJ Publications reference books in the past, and while some of the translations lacked grammar, they were able to be figured out. From what I can see and have read in the past, the first thing to do is to remove the staples that bind the booklet together, which I suppose is akin to rippin' the plastic off of a kit box and opening it up. More to follow as I get further into my project. After removing the staples from the spine of the booklet carefully, I checked out the sheets that resulted. The four lightweight cardboard sheets that feature the outside parts for the kit are printed in color and black and white in a matte finish. Since they are designed to be cut out from the sheets and either folded or bent and attached these sheets are only printed on one side. The remaining sheets are printed on a much lighter sheet material, about like typewriter paper. 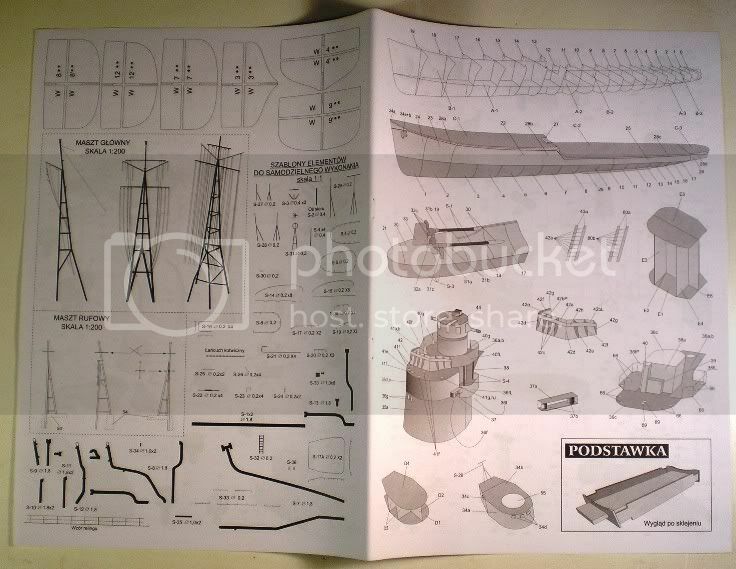 And they not only include the instructions with all the numbered parts, a set of parts that the modeler will have to make up from wire of some sort in 1/1 scale for railings, antennas, staffs, a radio direction finder and rigging wire supports for the turrets fore and aft. There is also a series in 1/1 scale to make up the various vent pipes and steam transfer pipes in a thicker wire or tubing of some sort. On this same page is the rigging layout for the forward and aft masts as well as the scale sized masts themselves. On the next page of this sheet is the layout for the hull pattern that the outer shell will be attatched to as well as some of the parts layouts for the various structures that will be made up from the parts on the other four sheets. The reverse of this page is all the rest of the structure plans in pictograph form. In the upper left corner you can notice a set of bulkheads that are part of the hull inner pattern. 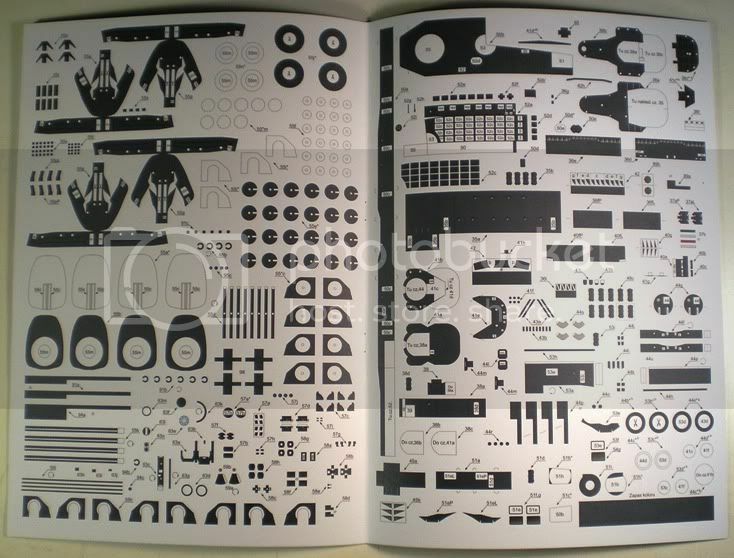 The remaining sheet is also printed on two sides, one side being all the advertising for other models that the company publishes and the opposite side being the rest of the hull inner patterns. These last two sheets posed a bit of a conundrum for me at first, since they are much lighter weight paper than the rest of the ship, I didn't think that it would make sense to simply cut them out and whip up what would be the heart of the hull as it were. 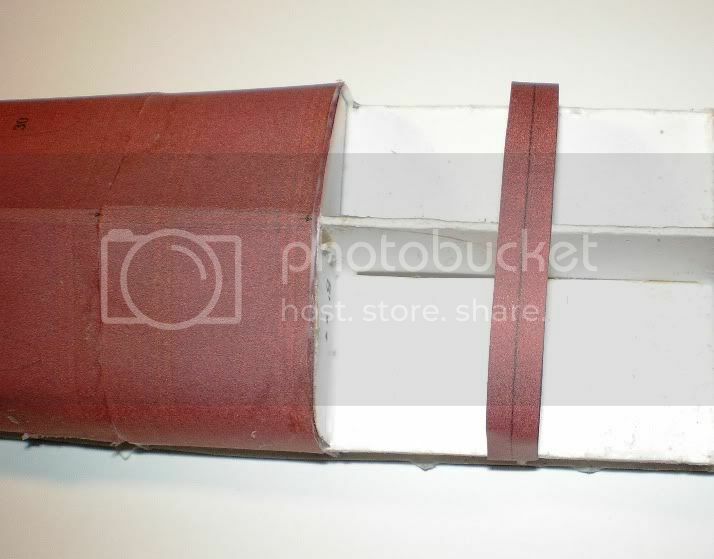 Checking around on a few sites that are devoted to paper modeling, I found out that most modelers will use either shirt cardboard or some other material similiar in nature to make these pieces from. 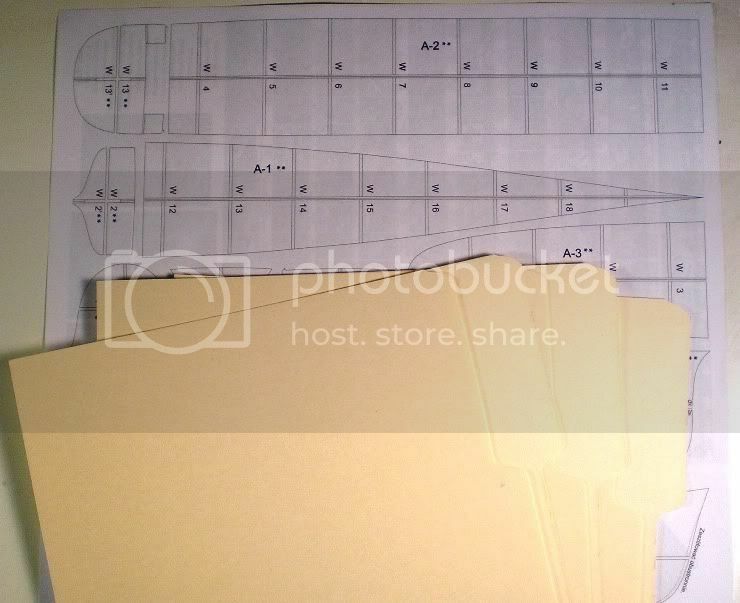 Since I have a pretty good stock of file folders, the good old yellow manilla material which is pretty close to what the other sheets are printed on, they should suffice to make up the inner hull as well as a few other support pieces that won't be seen but are on these sheets. Having a handy copier that I can just pop copies of the sheets from without any distortion will enable me to transfer the patterns and still keep the sheets intact. This offers me the ability to make up my paper model and still save these for future use as a basis for a styrene conversion. The inside of the outer covers are not wasted, the front one contains the specifications, history and a few directions for the models' construction. I will no doubt avail myself of the Babelfish site to translate this by manually copying and pasting the text to see if there are any little notes that would be of use to me in my project. 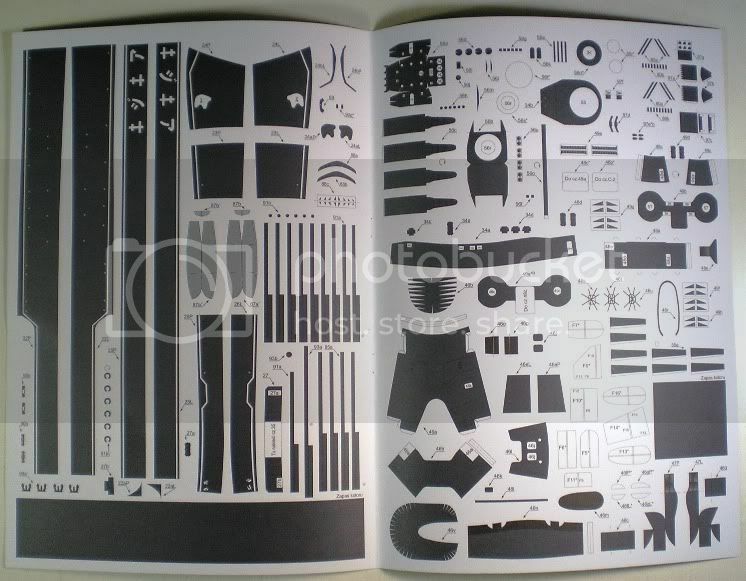 The inside back cover contains the side view and top view of the model with the parts call out numbers of the various parts to reinforce the other pictograph style directions on the other pages. As you can tell by the glare from the one page, this is shiny magazine type paper, sorry about that. 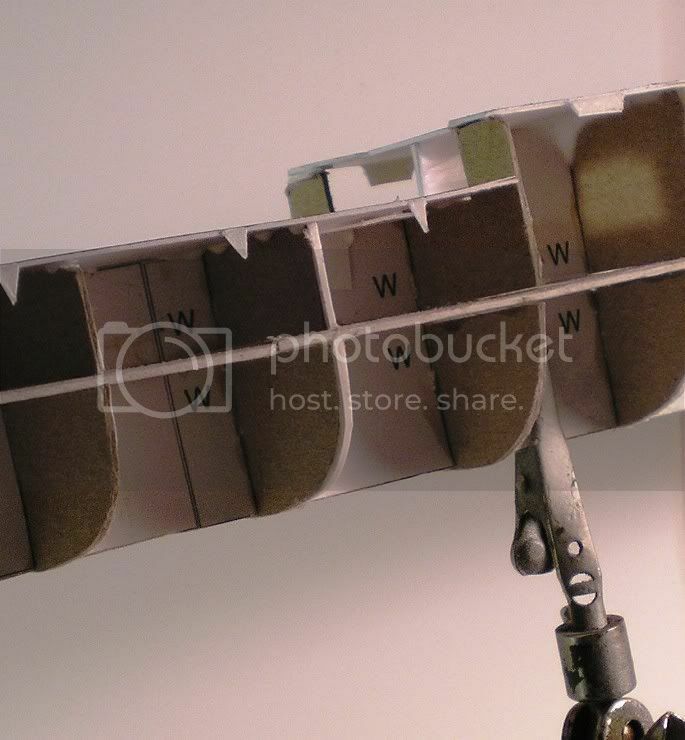 While I am copying and clipping the first parts, the inner hull, I will also be checking out other paper model sites and forums trying to gain a little more insight and instruction on this fine art in my efforts to build my first paper model. I am also going to be shopping about for some PE additions to add to the project such as the main railings and possibly some of the other parts as welll to save myself some aggrivation and time. 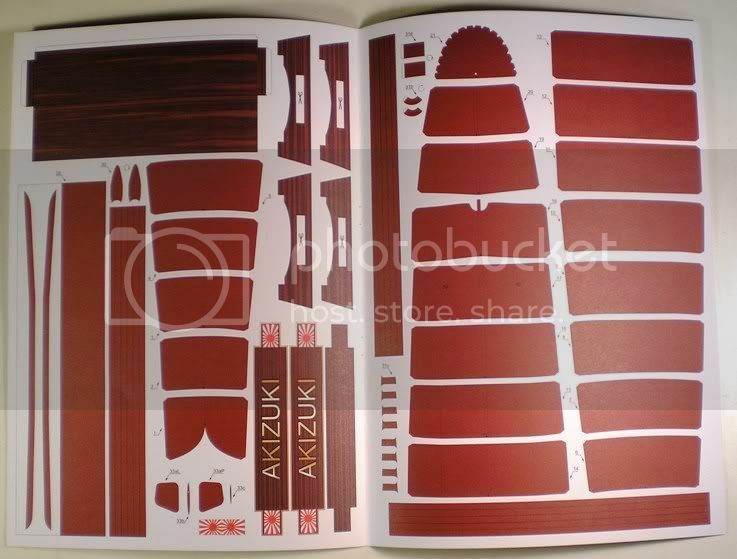 One of the places that I will be frequenting will be Joe Lowes' Mechanisms of the Imperial Japanese Navy 3D site on the Akizuki, I used it quite a bit when I constructed the last styrene version of the ship in 1/700 scale. He has made up views of most of the exterior portions of the ship in great detail that will no doubt be of great use for this project. Here is a link to that site, in case you would like to check it out for yourselves. Stay tuned for future updates as I work my way through this one. I will post any problems that I manage to discover as well as the ones that I conjure up on my own, I am sure that there will be a few here and there. I will also include links to any relevant sites that I discover so that you can see where I come up with my information as well as enjoy some of the wondorous builds that I have seen, all made out of good old paper. Just read through the thread - nice. love the paper side. I have a couple of other irons in the fire on the Model Shipwirghts site but this is something I have been wanting to do for a few years now and since I discovered this little side section, it is full speed ahead as it were. I have done some paper models many years ago, they were a total blast. I'm going to enjoy this one in dry docks. If you have any of your old builds around I would enjoy seeing some of them Scott, sounds like a perfect excuse to add another thread to me. After spending a most enjoyable morning touring about the ship pages of the Paper Modeler forum site and seeing some fantastic builds as well as picking up a number of tips, hints and down right education (gasp!, at my age no less), I have come to a few conclusions about my plan of attack. First off, the inner hull is indeed, the most important part of the build. My ideas of using some file folders for that part is somewhat on the lame side. 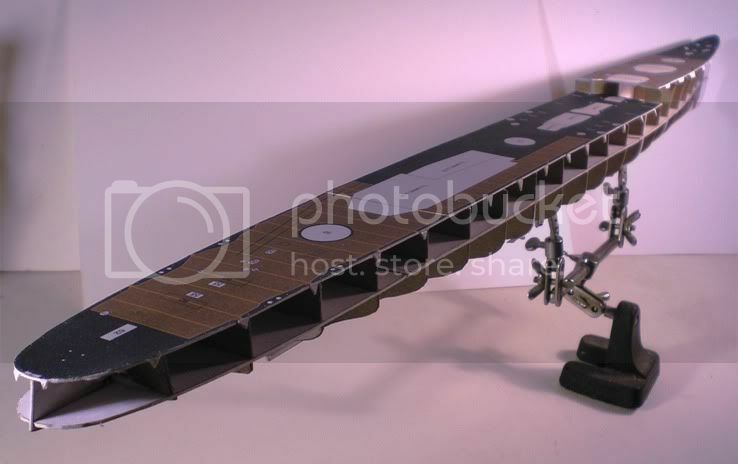 Actually, this part needs to be heavily reinforced, just looking at the width of the spacing of the notches on the layout parts should have been a clue, but then I am a treadhead. 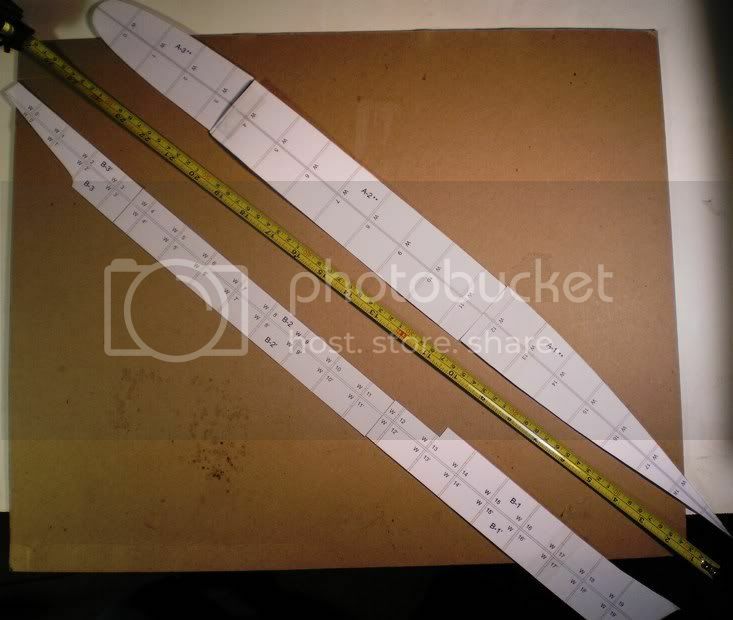 I will be cutting out the patterns for it using my copies and then doing some serious laminating in order to come up to the correct thickness for these parts. Once they are built up and assembled, it comes time to reinforce what I have. This is to help in keeping things straight and level as well as eliminating any flex that might interfere with keeping things that are added later from going on correctly. Once I am satisfied with that part, I will be adding some strips of material to the outer edge of each of the bulkheads to attach the outer hull parts to, something that I had not considered before. 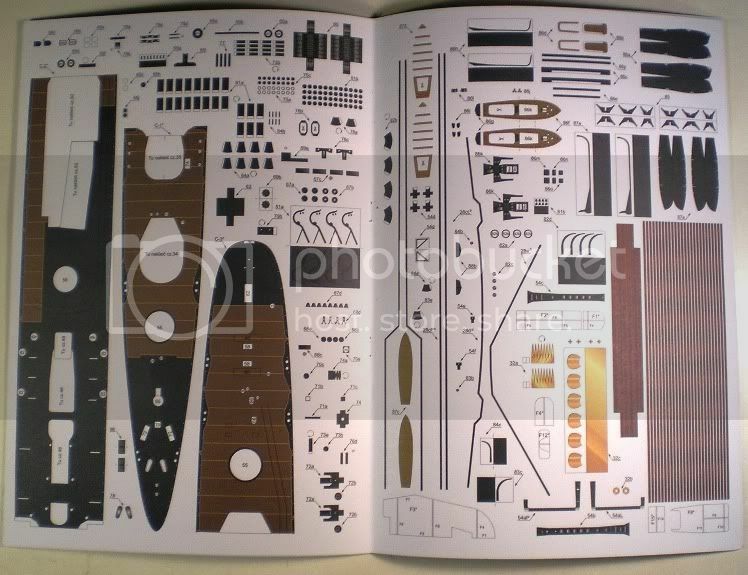 Going through the various threads on the Paper Modelers site also clued me in that unless you manage an excellent job on the inner hull some adjustments may be necessary once you get the plating in place. I observed everything from Elmers glue to candle wax being used in this process and I never thought that it would be needed or possible, but some were sanding parts and painting them to get things to look right. If done properly the hull should rival anything that is constructed from styrene, fiberglass or wood. Looking at some of the builds there was a revalation for me as well as a learning experience. I always sort of considered paper modeling to be the poor sister to plastic but I am rapidly finding out that plastic is merely an expedient method to arrive at a model. Some of the construction techniques used in plastic building transfer to paper modeling directly which I have discovered are also used in wood modeling. Things such as building up as much of a detailed structure off the model as is possible so that you can attatch the finished section without harming other surrounding parts. Rigging these things out is a great deal of work just as it is with most other mediums of construction and very nearly as popular. Being in a larger scale it is however somewhat less tedious since the materials can be handled a little easier. I have observed some methods for making up ladders and railings from thread and CA that when done correctly make brass an unecessary addition to the build. Materials such as Q Tips can be used to make up the vent pipes and other bits of structure if you really are into it. Brass wire is also used for a number of tasks in various gauges. So this really is a multimedia experience after all. In the case of my build, I have discovered that Toms' Model Works has a number of Photoetched parts sets that are quite compatible with my project and since I lack a lot of the patience and experience required to turn out these parts from the various methods I have observed, I shall be adding his IJN Destroyer set as well as IJN Cable Reels and Doors and Hatches sets to this project. These will be useful for other builds as there are enough parts in the accessory parts sets to utilize for more than one build. While it is a case of throwing some money at a situation to make it better, in my case it will take away a lot of the time required to build up my project. So stay tuned for more as I delve into and, no doubt, learn a lot more things about what it takes to turn out a model from something other than styrene or resin. Oh, and if you would like to check out some of the things that I have been babbling about in this post you can go check out the Paper Modelers site here. 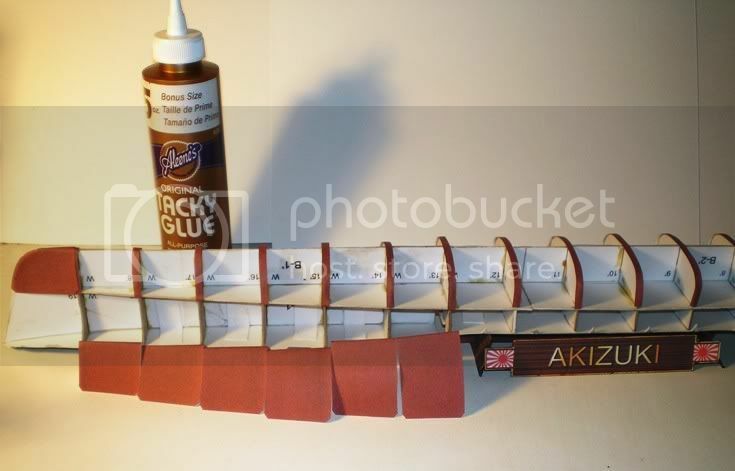 After spending the day working my finger to the bone pushing the copy button on my trusty Epson printer/scanner and doing some serious scissors work on the resulting print outs, I have managed to come up with the needed bits to start working on the inner hull form for the Akizuki. There are 20 bulkheads from stem to stern numbered from "0" to "19" that have corresponding locations on the six forms that create the vertical and horizontal keel and mid deck sections. There are also several other bits that are used to make up the inner parts for the bridge, deckhouses, and other bits and bobs. Working my way through the parts printed on these thinner paper sheets also clued me into the fact that there are even more of these types of parts that appear on the colored thicker sheets as well that I will have to copy and cut out to make up the funnel assembly and a few more things inner workings. I have come to the conclusion after touring about the Paper Modelers site some more that just about everything including these thicker paper sheets will need to be reinforced with more cardboard underlayments just like the plain paper sheets which was a bit more of my education into this fascinating branch of our hobby. At any rate, here are the various parts that I have thus far managed to conjure up from the plans; laid out on a sheet of cardboard of one of the types that I will be using. 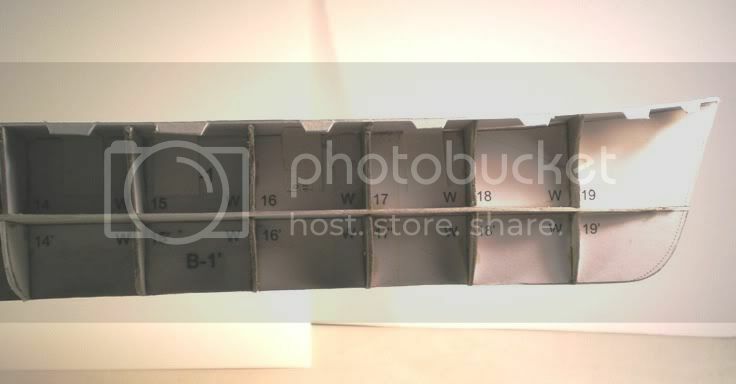 It is some 2mm stock that I got from my work, we use it there to back photographic prints for the wedding photography sales division of the photo company I work for here in Las Vegas. If some of the stock is bent or creased or has a damaged edge it is tossed out as unacceptable, which for my purposes is just fine since I can cut and trim my way around any bad places and offers me "free" material to work with. And just like expectant parents, I wanted to get an idea of just how big my "baby" is going to be so I had to lay out the two vertical and horizontal structures and measure them to see what the length of inner hull will be. It measures out to 26 and 1/8th inches long overall, a much grander length than the 1/700 scale models that I am used to working over, most destroyers in that scale work out to a "mere" 6 to 7 inches in length. I will be using the 2mm cardboard as underlayment to all of these pieces that make up the inner hull form for strength as well as ease of working. To do this will require using some glue to attatch the paper to the cardboard. From reading the threads on the other forums this has shown that there are almost as many preferences for this as there are for putting together styrene kits. But since I have a quart sized can of DAP Weldwood Contact Cement at hand that is going to be my product of choice. Contact Cement is one of the preferred types by several of the more experienced modelers over there since it does not bleed through the paper and offers a pretty fair bond to the cardboard. Once the parts are all glued down I get to cut them all out all over again. This time it will be using a razor knife and a straight edge for as many of the parts that I can as well as some creative use of shaped forms and a little freehand work to accomplish all the complex curves that these parts represent. Once they are all cut out and trimmed I can actually start assembly of this most important piece of the model. I have a chunk of 3/4 inch plywood that will be used as my cutting board to save the surface of my bench as well as preserve the much paint stained and glue bedecked cutting mat that I doubt would stand up to the likes of the hacking that will be taking place. Me, being me of course, I do expect to have to remake and possibly have to re-remake a few of them due to the complexity of their shapes (see screen name for explaination), but then I do have the original printed parts still intact and unharmed on their sheets that I can work from so it is mostly just a lot of fitting and fiddling on my part, much more so than on a styrene kit, but then if I goof up something, it can be replaced without having to write to the manufacturer to beg for, offer to pay with my first born male child, or plead for a new part. Stay tuned to the next installment to see how many parts I had to remake as well as how many digits remain or had to be reattatched. Well, my educaton on this subject is fast approaching light speed. I did some translating and with a heads up from one of the more experienced builders on the Paper Modelers site, I have found the rather helpful key to the symbols section of the instructions which tells you what sort of materials need to be used for various sections of the build. It plainly states that the inner hull is to be mounted on 1mm thick material not 2mm. Needless to say, this helps quite a bit and avoids a lot of serious cutting time since the material involved is a lot lighter and easier to cut. Since I have yet to start gluing any of the forms to anything it also comes at a perfect time to save a lot of recopying and cutting out with scissors. Most of the material called for in this project is of 0.5 mm and 1mm thick along with something called "Bristol" paper, something that I have yet to decipher. I shall continue on with my education in this subject and let you all hear about my adventures in the art of paper modeling as well as seeing just what I am accomplishing as time goes on. I found out what "Bristol" means in paper kit parlance, basically,gluing a sheet of the same thickness as the part is made from to double it up. I spent my day smearing some contact cement to cardboard and paper parts, waited a bit for things to set up and then placed the parts on the cardboard. Taking a tip from the Paper Modelers site on cutting, I started with the hobby knife cutting out the really inward curving shapes of the bow section first. Once that was done and I was up to straight runs and outward curves I switched to my trusty scissors to do the bulk of the work. Working slowly and carefully, I managed to get the small parts cut out then started on the hull shapes. These were mostly just scissors work with the only exception being the small undercut at the bottom of the fantail, the hobby knife made short work with that. Using a nice fresh blade with the #11 Xacto made cutting the 1mm thick cardboard pretty easy. I did resharpen my scissors with a sharpener made for the purpose so that they were nearly as sharp. this is pretty important, dull tools will make life a lot harder in dealing with this, it also causes you to run off the lines or into them and spoil the work necessitating a redo. So this is where I am at now. I will figure out how to interlock all these shapes together then once I am happy with how they work, I can use the contact cement to glue things up. 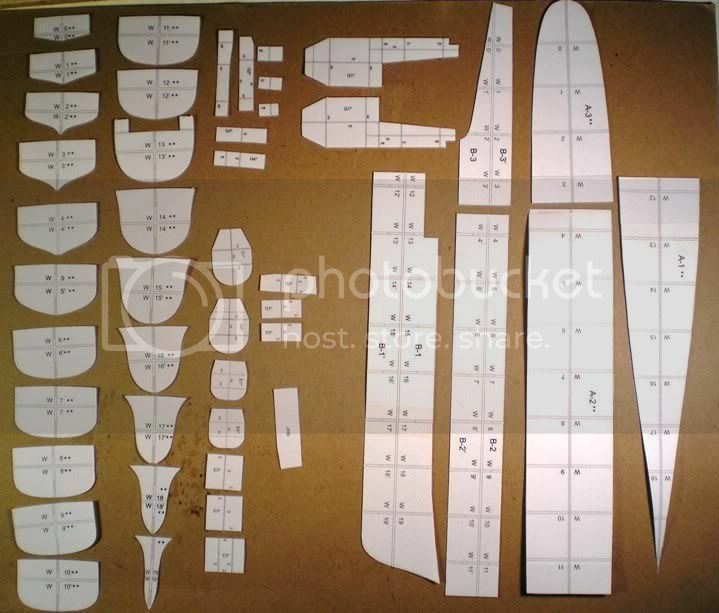 I have been busily engaged in hacking away at the parts to notch out the various forms and bulkheads thanks to a tip from the experts at Paper Modelers forum. It has required cutting the horizontal long hull form into its' three peices then spliting each in half. The vertical form gets to stay in one piece, just had to notch out all the places where the bulkheads go. I did manage to split all the bulkhead pieces and notch up the first three for a trial fitting with the two respective horizontal forms. It actually looks like it is supposed to! It has also become obvious to me that over test fitting the pieces should be avoided, the more you fiddle with them, the looser the fit becomes and I want to keep things nice and tight until I can glue them all together. Tonight I will get to notch out the remaing bulkheads and once I put it all together I will shoot a couple of pictures to show my progress so far. The only thing harmed in all of this hacking and dicing was a couple of #11 Xacto blades, gotta keep sharp ones to be able to make precise cuts in the material. Glad that I bought that 100 pack of blades a while back. After two evenings of slicing up the collection of parts that I have managed to accumulate up to now and then notching them up to be able to be joined, this is starting to look a bit like a ship. First a shot of all the parts after separating them into the sections I would need to be able to assemble the inner hull form. I ran through three #11 Xacto blades just to ensure that the cuts would be nice and clean as well as fairly tight when joined. I got out the Contact Cement and a couple of toothpicks to use as application tools. Applying the cement in sections from the stern section first making sure to coat all the surfaces that would actually join together, I started with the parts on the bottom, added the mid section then trapped it all together with the parts that came down from the deck surface. I will admit to a little adjustment to line everything up, but the cement allows for that and then it was on to the midsection parts the same way that I did the stern. I was quite surprised at how the addition of the parts made the whole thing become rather stiff. It all seemed to line up pretty well. By the time I got to the bow section, it was like a solid form even though it is just the inner hull part, not at all what I had anticipated. I do have to sand down a little of the center ridge on the back section of the ship, it sits a little proud in places, but I want to have a flat surface for the deck to lay down on. Sighting down the keel line, it is relatively straight so I won't have to deal with any fiddling about there. This is what I have arrived at for my two evenings of work since figuring out what I would have to do to turn a lot of copy paper into parts to start with. Now on to the next part, getting the bottom of the hull on there. From what I have seen there are a couple of ways to go about this, I will fill you in on what I decide to do as my build progresses. Having survived vacation and the dreaded first week back at work, I have been tinkering at my project here when I have the time. I had to go over the inner hull form a number of times with a critical eye making sure that everything was good to go before adding any thing else. I did have a high spot on the back of the upper section that a little sanding took care of. I am finding out that even with a paper model, sandpaper is your friend. I also had a few places where it was necessary to add some material to the edges of the bulkhead forms so that when it comes time to add the hull plates and side plates as well as the deck, things would come out right. By cutting narrow strips of card and using some Aleene's Tacky Glue to attach them I was able to sand things back down to the correct form so that took care of those little problem areas. 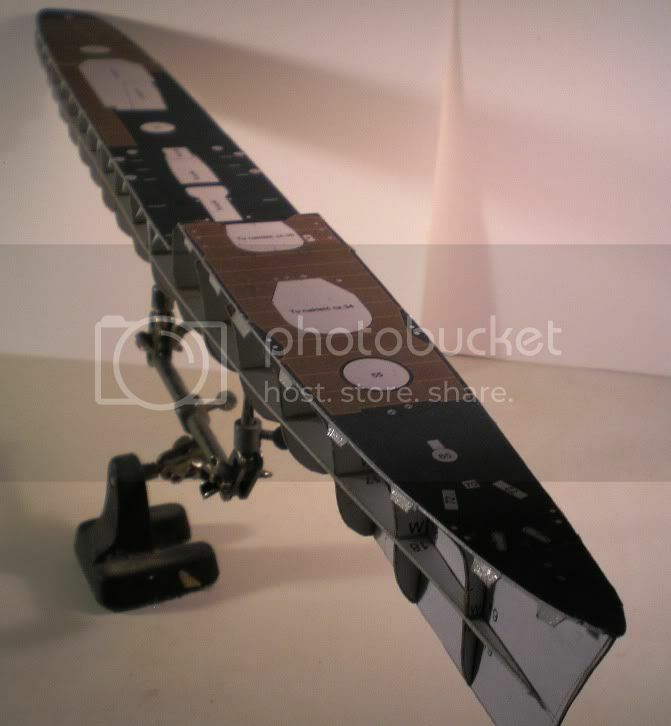 Once I had it ready, or so I thought, I attached the forward deck. That showed an area that it was necessary to add a little more material but it was easy to deal with. It was better to add the material than to try and just make the part fit, that would have created a problem later on when fitting other parts. Here is where she is now with her decks added. I added some "L" brackets inside to help add a little extra gluing surface to ensure nothing comes undone later as I handle the model. Looking back, these probably weren't needed, but they don't detract from anything so they stay. Here you can see where I have had to ad some material to make the bulkhead forms come out to where they needed to be to avoid having any sink ins when I go to attatch the hull plating and bottom to the model. You can also see where I had to add some to the step up section to keep from having to bend anything to get the deck shaped right. I still have a bit more sanding to do, but it is shaping up to fit the bottom strips and plates to the hull now. 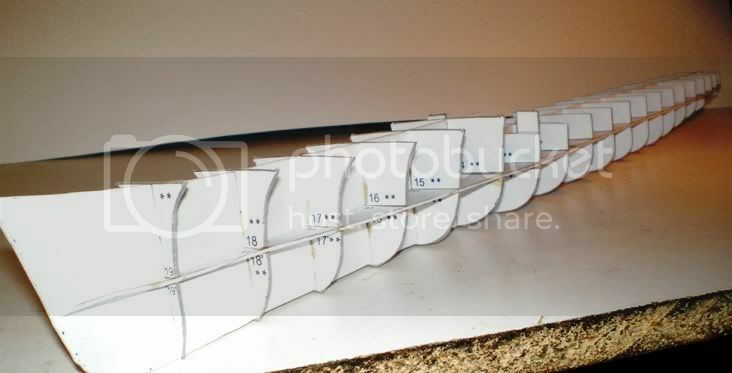 I am finding out that paper or card models are a lot more finicky than the plastic variety. Everything has to be spot on as far as one step goes before adding anything else. Having a critical eye towards shaping and fitting the parts together is most necessary with one of these kits. But taking your time and looking at everything twice before proceeding to the next step is mostly patience, don't get in a hurry and it yeilds some satisfying results. After a couple of false starts yesterday due to some female interference with my plan for the day, I have gotten back to the serious work at hand today. I started off the hull plating by clipping out the fairing strips from preprinted card sheets following the idea of using single strips for each of the bulkhead forms. After getting them all cut out and glued in place, I started cutting out the hull plates. Once these were all cut out and numbered on the back so I wouldn't have any mix ups in position, I glued the bow and stern pieces in place. So far so good. I used the edge of the scissors to draw each plate over the edge to impart a curve to each half of the plate to make them fit a bit better. By the time I got to about the third plate, it became obvious that despite all my careful gluing work, I was just not going to have enough glue surface from a single width of the strips. I clipped out a bunch of double wide strip material, removed the old single width strips and after cleaning up the surfaces of thing reglued the double wide strips in place. Getting back to work I added the rest of the plates each in turn. Before applying any glue I test fit each one to make sure of the direction that it would need to go and how it fit best. Once I had everything in place, it was beginning to look rather ship like. I did notice that despite all my fitting of things, I had a little overhang on some of the plates above the waterline longitudinal form. I used a hobby knife to trim things back so that everything was nice and neat. I will be working on the props, rudder and all the related gear next. I did notice that for the prop shafts they call for parts S-1, looking on the sheets, I can find no S-1 parts. I am going to assume that this means to substiture a shaft of some kind in that place, I will probably use some styrene rod to make those pieces. Once I have these parts done up, I can shoot a coat of Testors' Dullcote on the hull bottom and let it dry overnight. I will sand that down a bit and smooth over anything on the hull bottom and then shoot on a coat of Model Master Acryl Hull Red to make it nice and smooth as well as uniform in color. That is one very interesting ship build. I never gave paper models a second look, but I think I may have been missing something. This is amazing! At the end of a mediocre day, I found this post. I'm smiling at this. Very nice...very precise work...good method. That's coming along nice. I've been wanting to try doing more with paper. I'm going to start with something a lot simpler. Probably an airplaine from Fiddlersgreen. great work! this really is something else, very nice to watch it evolve. thanks for sharing.